William Clarence Eckstine (July 8, 1914 – March 8, 1993) was an American jazz and pop singer, and a bandleader of the swing era. He was noted for his rich, resonant, almost operatic bass-baritone voice. Eckstine's recording of "I Apologize" (MGM, 1948) was awarded the Grammy Hall of Fame Award in 1999. The New York Times described him as an "influential band leader" whose "suave bass-baritone" and "full-throated, sugary approach to popular songs inspired singers like Joe Williams, Arthur Prysock and Lou Rawls." Eckstine's paternal grandparents were William F. Eckstein and Nannie Eckstein, a mixed-race, married couple who lived in Washington, D.C.; both were born in 1863. William F. was born in Prussia and Nannie in Virginia. His parents were William Eckstein, a chauffeur, and Charlotte Eckstein, a seamstress of note. Eckstine was born in Pittsburgh, Pennsylvania; a State Historical Marker is placed at 5913 Bryant St, Highland Park, Pittsburgh, Pennsylvania, to mark the house where he grew up. Billy's sister, Maxine (married name Whedbee), was a well-respected Spanish teacher at Taylor Allderdice High School in Pittsburgh. He attended Peabody High School before moving to Washington, DC. He attended Armstrong High School, St. Paul Normal and Industrial School, and Howard University. He left Howard in 1933, after winning first place in an amateur talent contest. Heading to Chicago, Eckstine joined Earl Hines' Grand Terrace Orchestra in 1939, staying with the band as vocalist and trumpeter until 1943. By that time, Eckstine had begun to make a name for himself through the Hines band's juke-box hits such as "Stormy Monday Blues", and his own "Jelly Jelly." In 1944, Eckstine formed his own big band and it became the finishing school for adventurous young musicians who would shape the future of jazz. Included in this group were Dizzy Gillespie, Dexter Gordon, Miles Davis, Art Blakey, Charlie Parker, and Fats Navarro, as well as vocalist Sarah Vaughan. Tadd Dameron, Gil Fuller and Jerry Valentine were among the band's arrangers. The Billy Eckstine Orchestra is considered to be the first bop big-band, and had Top Ten chart entries that included "A Cottage for Sale" and "Prisoner of Love". Both were awarded a gold disc by the RIAA. Dizzy Gillespie, in reflecting on the band in his 1979 autobiography To Be or Not to Bop, gives this perspective: "There was no band that sounded like Billy Eckstine's. Our attack was strong, and we were playing bebop, the modern style. No other band like this one existed in the world." Eckstine became a solo performer in 1947, with records featuring lush sophisticated orchestrations. Even before folding his band, Eckstine had recorded solo to support it, scoring two million-sellers in 1945 with "Cottage for Sale" and a revival of "Prisoner of Love". Far more successful than his band recordings, these prefigured Eckstine's future career. Eckstine would go on to record over a dozen hits during the late 1940s. He signed with the newly established MGM Records, and had immediate hits with revivals of "Everything I Have Is Yours" (1947), Rodgers and Hart's "Blue Moon" (1948), and Juan Tizol's "Caravan" (1949). Eckstine had further success in 1950 with Victor Young's theme song to "My Foolish Heart," and the next year with a revival of the 1931 Bing Crosby hit, "I Apologize". His 1950 appearance at the Paramount Theatre in New York City drew a larger audience than Frank Sinatra at his Paramount performance. Eckstine was the subject of a three-page profile in the 25 April 1950 issue of LIFE magazine, in which the photographer Martha Holmes accompanied Eckstine and his entourage during a week in New York City. One photograph taken by Holmes and published in LIFE showed Eckstine with a group of white female admirers, one of whom had her hand on his shoulder and her head on his chest while she laughed. Eckstine's biographer Cary Ginell, wrote of the image that Holmes "...captured a moment of shared exuberance, joy, and affection, unblemished by racial tension." Holmes would later describe the photograph as the favorite of the many she had taken in her career as it "...told just what the world should be like". The photograph was considered so controversial that an editor at LIFE sought personal approval from Henry Luce, the magazine's publisher, who said it should be published. The publication of the image caused letters of protest to be written to the magazine, and singer Harry Belafonte subsequently said of the publication that "When that photo hit, in this national publication, it was if a barrier had been broken". The controversy that resulted from the photograph had a seminal effect on the trajectory of Eckstine's career. Tony Bennett would recall that "It changed everything...Before that, he had a tremendous following...and it just offended the white community", a sentiment shared by pianist Billy Taylor who said that the "coverage and that picture just slammed the door shut for him". Among Eckstine's recordings of the 1950s was a 1957 duet with Sarah Vaughan, "Passing Strangers", a minor hit in 1957, but an initial No. 22 success in the UK Singles Chart. The 1960 Las Vegas live album, No Cover, No Minimum, featured Eckstine taking a few trumpet solos and showcased his nightclub act. He recorded albums for Mercury and Roulette in the early 1960s, and appeared on Motown albums during the mid to late 1960s. After recording sparingly during the 1970s for Al Bell's Stax/Enterprise imprint, the international touring Eckstine made his last recording, the Grammy-nominated Billy Eckstine Sings with Benny Carter in 1986. Culturally Eckstine was a fashion icon. He was famous for his "Mr. B. Collar"- a high roll collar that formed a "B" over a Windsor-knotted tie (or without a tie at all). The collars were worn by many a hipster in the late 1940s and early 1950s. He married his first wife, June, in 1942. After their divorce in 1952, he remarried shortly after to actress and model Carolle Drake in 1953, and they remained married until his death. He was the father of four children by his second marriage and two step-children, including Ed Eckstine, who was a president of Mercury Records, Guy Eckstine, who was a Columbia and Verve Records A&R executive and record producer, singer Gina Eckstine, and actor Ronnie Eckstine. 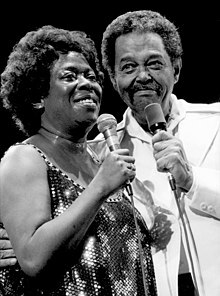 Eckstine suffered a stroke while performing in Salina, Kansas, in April 1992, and never performed again. Though his speech improved in the hospital, Eckstine had a heart attack, and died a few months later on March 8, 1993, aged 78. Eckstine's final word was "Basie". Eckstine-style love songs opened new lines of communication for the man in the man-woman merry-go-round, and blues a la B were the essence of cool. When he made a recording of "Caravan", I was happy and honored to watch one of our tunes help take him into the stratosphere of universal acclaim. And, of course, he hasn't looked back since. A remarkable artist, the sonorous B. ... His style and technique have seen extensively copied by some of the neocommercial singers, but despite their efforts he remains out front to show how and what should have been done. Sammy Davis, Jr. made several live appearances and impersonated Eckstine. Eckstine was a pallbearer at Davis' funeral in 1990. Quincy Jones stated in Billboard: "
I looked up to Mr. B as an idol. I wanted to dress like him, talk like him, pattern my whole life as a musician and as a complete person in the image of dignity that he projected.... As a black man, Eckstine was not immune to the prejudice that characterized the 1950s. If he'd been white, the sky would have been the limit. As it was, he didn't have his own radio or TV show, much less a movie career. He had to fight the system, so things never quite fell into place." He was one of the greatest singers of all time.... We were proud of him because he was the first Black popular singer singing popular songs in our race. We, the whole music profession, were so happy to see him achieve what he was doing. He was one of the greatest singers of that era... He was our singer." 1986 I Want to Talk About You (Xanadu) – This compilation features Eckstine's earliest recordings, thirteen selections from his 1940–1942 Bluebird sides with the Earl Hines Orchestra; plus three ballads from a 1945 live "radio broadcast" with his big band. 1996 Air Mail Special () – reissue of the 1945 live "radio broadcast" recordings. 1996 The Magnificent Mr. B (Flapper/Pearl) – anthology/compilation of material recorded with Earl Hines (for the Bluebird label), and Eckstine's recordings with his orchestra (for the DeLuxe and National labels). 2002 The Legendary Big Band 1943–1947 (Savoy Jazz/Denon) – 2-CD anthology (all of Eckstine's recordings for the De Luxe and National labels). 2005 Early Mr. B: 1940–1953 () – anthology/compilation of material recorded with Earl Hines (for the Bluebird label), and Eckstine's recordings with his orchestra (for the DeLuxe, National and MGM labels). 2006 Prisoner of Love: The Romantic Billy Eckstine (Savoy Jazz/Denon) – this is a reissue of Timeless: Billy Eckstine. 2008 All of My Life (Jasmine) – 2-CD anthology (contains 35 tracks recorded for MGM; includes all 10 of his 1956 RCA recordings; and 10 of his 1957–1958 Mercury recordings). 2013 Billy Eckstine: Seven Classic Albums () – 4-CD reissue package includes these 7 albums, Billy Eckstine's Imagination; Billy Eckstine & Sarah Vaughan Sing the Best of Irving Berlin; Billy's Best! ; Basie/Eckstine Incorporated; No Cover, No Minimum; Once More With Feeling; At Basin Street East. ^ a b Roberts, David (2006). British Hit Singles & Albums (19th ed.). London: Guinness World Records Limited. p. 178. ISBN 1-904994-10-5. ^ Giddins, Gary (April 10, 2000). Visions of Jazz: The First Century. Oxford University Press. p. 260. ISBN 978-0-19-971520-6. ^ The New York Times Biographical Service. New York Times & Arno Press. January 1993. p. 342. 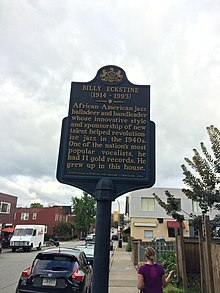 ^ "Billy Eckstine - Pennsylvania Historical Markers on". Waymarking.com. October 29, 2006. Retrieved March 26, 2012. ^ "Billy Eckstine - Pittsburgh Music History". sites.google.com. ^ a b "Billy Eckstine "Mr. B and His Band"". Big Band Library. Retrieved May 25, 2011. ^ "Billy Eckstine at All About Jazz". Allaboutjazz.com. Archived from the original on July 19, 2011. Retrieved May 25, 2011. ^ Murrells, Joseph (1978). The Book of Golden Discs (2nd ed.). London: Barrie and Jenkins Ltd. pp. 33/4. ISBN 0-214-20512-6. ^ Ginell 2015, p. 112. ^ a b Ginell 2015, p. 113. ^ Dennis Hevesi (September 30, 2006). "Martha Holmes, 83, Pioneer in Photography, Dies". The New York Times. Retrieved December 22, 2015. ^ Ginell 2015, p. 114. ^ Ginell 2015, p. 116. ^ Ginell 2015, p. 186. ^ Ginell 2015, p. 187. ^ Billboard, March 20, 1993, p. 10. ^ Leonard Feather, The Pleasures of Jazz: Leading Performers on Their Lives, Their Music, Their Contemporaries. New York: Horizon Press, 1976. Dell edition, 1977, p. 127. ^ "Billy Eckstine Cremated Following Private Rites; Stars Pay Tribute to Him". JET. 83 (22): 18. March 29, 1993. ISSN 0021-5996. Ginell, Cary (2013). Mr. B: The Music & Life of Billy Eckstine. Hal Leonard. ISBN 978-1-45841-980-4.